They scored early and seized the initiative. They never trailed. And they shut the door with conviction. Three seasons of painful losses and frustrating ties to the Twin Falls Bruins ended Tuesday for a determined group of Wood River High School girls’ soccer players. Wood River sophomore Jesse Cole scored twice after senior Megan Murphy gave the Wolverines an early 1-0 lead, and the Hailey girls shut the door on Twin Falls 3-2 in a Great Basin Conference showdown at South Valley Sports Complex soccer field, Hailey. Coach Doug Stouffer’s Wolverines (5-1-0, 2-0-0 league) won their fifth straight game behind a ferocious second-half defense led by Cole’s older sister Rory Cole and sophomore goalkeeper Molly Whittington (7 saves). The Wood River win snapped a 38-game Twin Falls unbeaten streak in Great Basin games dating back to a 4-3 Bruins’ loss to the Wolverines in the 2010 GBC league championship game. Since, Twin Falls had won three straight league titles and was 6-0-3 with 23-5 goals-against against Wood River since 2010. Coach Katie Kauffman’s Bruins walloped Wood River 4-0 in the 2013 State 4A tournament consolation game. That recent Twin Falls dominance changed Tuesday. Murphy, one of nine Wood River seniors, scored her second career goal in the third minute after a Samantha Sutton free kick bounced over to her on the right flank. Murphy checked inside for a centering pass, but elected to shoot instead—and her perfectly-placed lob shot sailed over the head of Bruins junior keeper Katelyn Behrens for a 1-0 lead. Ten minutes later, Jesse Cole went in alone on Behrens (5 saves), who made a great stop that seemed to spark the slow-starting Bruins offense. The Bruins started linking their passes, making Wood River chase the balls. In the 25th minute, Bruins freshman Ellie Jackson raced down the right wing and belted a high shot from 28 yards that fell in over Whittington’s head. Jesse Cole made sure the 1-1 tie didn’t last long when she slipped behind the defense and beat Behrens with a shot on the ground in the 30th minute for a 2-1 Hailey lead. In the 39th minute, senior Mehli Marcellus of Twin Falls lifted another long shot, from 35 yards, for a 2-2 halftime tie. Two minutes into the second half, Wood River secured the eventual winner when senior Olivia Thornton distributed the ball to senior Lucy Brannon, and Brannon chipped it ahead to Jesse Cole. The Bruins’ defense couldn’t stop the quickness of Cole, who went in alone once again for her eighth goal and 39th of her two-year career. The Bruins had several good chances in the second half starting in the 53rd minute when senior Peyton Karl hit the crossbar and Chayse Avalos shot wide on the rebound. But keeper Whittington was alert and prepared for everything. Stouffer said, “Molly gave up two goals over her head in the first half, but she took away a lot of dangerous plays and did very well for us. Jesse Cole left the game in the 60th minute with a calf injury and Peyton Karl needed to be carried off for Twin Falls three minutes later. But Rory Cole was a warrior with her sister seated on the sideline. She blocked a shot right in front at 70 minutes, and won ball after ball in the midfield. Playing terrific defense were Kenya Schott, Timber Kelly, Cristina Vega Escobedo and Megan Johnston. Applying constant pressure on the ball were Emerson McCune, Tate Morell, Emily Thayer and Ashley Carnduff. Brannon did a great job of chasing down everything in sight up front. Twin Falls out-shot Wood River 14-10 and had a 4-1 edge in corner kicks, but the Wolverines had a few more free kicks because of the Bruins’ physical style of play. Three-time defending GBC champion Twin Falls (4-3-0, 1-1-0) has now been limited to two goals or fewer in each of its seven games this fall. Wood River visited Burley (2-3-0, 1-1-0) Thursday. 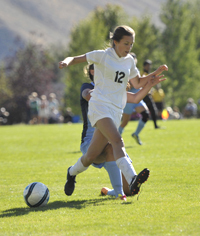 On Tuesday, Sept. 16, the Wolverines host Canyon Ridge of Twin Falls (2-5-0, 1-1-0). After its 1-1 shootout loss to Twin Falls Sept. 4, Canyon Ridge ended a three-game skid with a 2-0 win at Burley Tuesday. As good as the Wood River High School boys’ varsity soccer team played in Saturday’s 4-0 home win over the Community School, well, let’s just say Twin Falls was a better team than Wood River on Tuesday. Wood River (3-3-0, 1-1-0 league) showed that it’s still trying to find its identity this season during a 4-0 league loss to resilient Twin Falls (2-4-2, 1-1-0). It was the second straight win for Twin Falls after its lopsided 10-2 loss to Canyon Ridge. The Bruins scored goals in the 47th, 77th, 79th and 80th minutes to snap a seven-game winless streak to Wood River teams dating to 2010. The Wolverines had been 6-1-3 against Twin for coach Monjaras. Wood River hosted the Burley Bobcats (0-4-0, 0-2-0) Thursday, Burley coming off an encouraging 4-3 road loss to Canyon Ridge Tuesday. Tuesday, the Wolverines visit Canyon Ridge (7-0-0, 2-0-0). The Riverhawks had a big game at Jerome (5-0-0, 2-0-0) Thursday.